The Rebels return home after four weeks on the road to face a confident Sunwolves team. Both teams come into this encounter following wins against Australian conference rivals. The men from Melbourne over the Reds at Suncorp Stadium, and the Sunwolves over the Waratahs in Newcastle. The Sunwolves got things underway, kicking off deep into the Rebels 22. 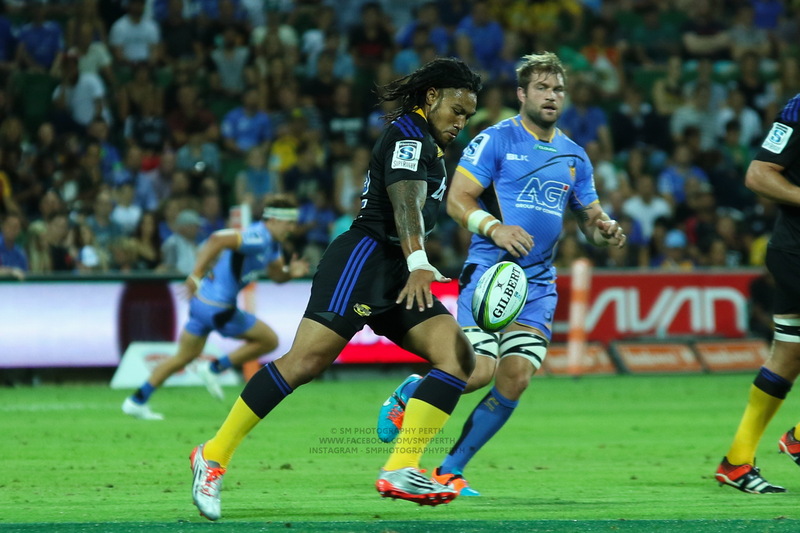 However, early pressure from the Rebels resulted in penalties near the Sunwolves line. Good early defence from the Sunwolves held out the Rebels but after a second scrum, Reece Hodge crashed over in the 7th min for his first of 3 tries. Quade Cooper converts, making it 7-0 to the boys in blue. On the restart, the Sunwolves camped down in the Rebels 22 with a few penalties resulting and the Sunwolves opting for lineouts. The Sunwolves coughed up the lineouts but with two clearing kicks from Cooper not going deep, Sunwolves flyhalf Hayden Parker decided on a subsequent penalty to take the points. He didn’t miss, of course, 7-3 to the Rebels. On the restart Koroibete mistimed the tackle, giving away a penalty to the Sunwolves with a kick downfield for a lineout. A dropped ball from the Sunwolves after a hard hit from Koroibete resulted in a scrum to the home side. A brilliant line break by English off the Rebels scrum was followed by an offload to Hodge for his second try of the evening. Cooper converts, bringing the score to 14-3. Reece Hodge scores three 5-pointers for the Rebels. The home side looked like they would again be next to score with some great offloading but a turnover to the Sunwolves nearly saw them score a try at the other end of the field if not for an ankle tap from Billy Meakes. A penalty to the Sunwolves saw them try for a lineout but it was stolen by Adam Coleman in another Rebels lineout steal. Making their way back downfield, off the back of a scrum win, Cooper kicks ahead for Billy Meakes to regather off a Sunwolves fumble (read: blunder) to dive next to the posts for 5 points. Again, Cooper kicks it over, making it 21-3 to the Rebels. Semisi Masirewa crashed over the Rebels’ line for the Sunwolves not long after the restart but the TMO disallowed it after good defence from Tom English, so it was taken back for the penalty advantage. 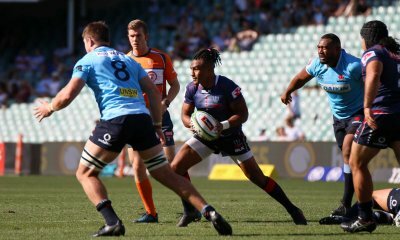 Referee Nick Berry warned the Rebels for too many penalties in the Sunwolves 22, discipline again being an issue for the Melbourne men this week. Masirewa got a try in the corner not long after, though, off a scrum the Sunwolves took as their penalty option. Parker missed the conversion, ending his impressive kicking streak at 28, scores 21-8. The Cooper restart did not go 10 metres so a Sunwolves scrum was set on halfway. A penalty resulted to the Sunwolves off the scrum with Parker taking a kick to the sideline for a lineout. They lost the lineout (again) and the Rebels, via Maddocks, cleared to near halfway. A bit of to-ing and fro-ing followed. With two minutes left in the half and off a Rebels scrum, Meakes broke the line and offloaded to Hodge who nearly made it for a hat trick but passed the ball to Cooper to take the pie. Cooper converted his own try on the half time siren and both teams going into the sheds at 28-8 to the Rebels.. The home side kicked off the second 40 minutes with the Sunwolves picking up the pace from the get-go. The Sunwolves would be the first to score in the second half with try scoring machine Semisi Masirewa bagging his second try with some good running and quite frankly, poor defence from the Rebels. Parker converts, closing the gap to 28-15 in favour of the Rebels. Some scrappy play from both teams ensued, but mostly from the Rebels. The Sunwolves advanced to the Rebels 22, with the home side on a second yellow card warning. The Sunwolves look to score their second try but are held up. A scrum is held and the Sunwolves go for the corner but good Rebels defence hold them out. Subsequently, down the other end of the field, Hodge charges down a poor clearing kick and grabs himself a hat trick. Cooper converts Hodge’s try to bring the scores to 35-15. It didn’t take long for the next try. A lineout 45m out is won by the Rebels with Genia breaking the line to score a brilliant individual try under the posts. Yet again, Cooper converts the try, scores 42-15. In the 75th minute, Rebels reserve back, Semisi Tupou is carded for a cynical offside, followed shortly afterwards by the Sunwolves’ Nathan Vella for dangerous play. The Rebels tried to pressure for a final try but the Sunwolves had other ideas and on the final play Campbell Magnay was carded for a high tackle after the full time siren. The Sunwolves couldn’t make anything of it and the scores finish at 42-15 to Rebels, bagging a bonus point win for their efforts. Semisi Masirewa continues his try-scoring ways. The Sunwolves may have shown up the Tahs the week before with an upset win, but the home side played the Sunwolves at their own, free-flowing game, only better. 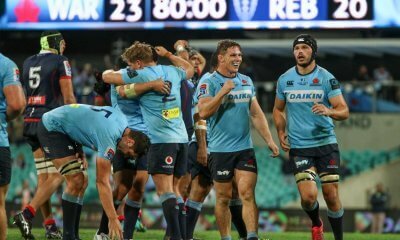 The Rebels increase their lead in Aussie conference with their next game scheduled for another home game next Friday night against the Stormers from South Africa. Quade Cooper continues to call the shots for his new team. The Rebels always looked in control, even though there were a few moments in the game where it looked like the Sunwolves might find a way to steal a win. Once Reece Hodge scored his third try in the second half, the gate was shut. The horse had bolted. Can I only pick one? Really? This makes it difficult. OK, he has had a relatively quiet start to the 2019 season, but tonight Reece Hodge really lit it up, bagging a hat trick in the process. So many Rebels have put their hand up (again) for Wallaby selection; Will Genia, Quade Cooper, Reece Hodge, Anaru Rangi, Luke Jones Isi Naisarani, just to name a few. Koroibete had a much more solid game this week, but I am still not convinced he is Wallaby material. Hodge is a good choice and can’t really argue, but can I put forth Luke Jones. Again. The work rate of this bloke is unbelievable. He is so physical, sucha a team player, always does he right stuff, but also proved he can run in the loose when given a chance. Parling deserves to perhaps be man of the match after that line out masterclass. Parling is a class act when it comes to the line out. Plenty of experience from England and the Lions to pass on. The Rebels’ defensive lineout has become a real weapon. The pressure that Jones and Coleman are putting on opposition throws is intense. The Sunpups were opting to take quick taps from penalties to avoid lineouts as their throws were either picked off or missing the target. Agree on Jones as MOTM, Meakes also good again. A hattrick to Hodge does make a good argument though. I don’t remember ever seeing a team stop kicking for the lineout on penalties before. Their lineout was really rattled. Normally the Moon Dogs would take the three points for penalties off Hayden’s accurate boot but because the Rebs got out to a quick, decent lead, they opted instead for lineouts in an attempt to get tries to close the gap. Didn’t work out for them. Luke Jones has played himself into a Wallabies bench appearance in my books. Astonishing that Cheika will probably play another second rower at 6 instead of givingthis workhorse a chance. Who knows with Cheika. He has the hots for Ned. Given how well Staniforth went on Saturday I’d start him over Hannigan. He was one of the main reasons the Tahs got so close. Only bench? He is the form loosie in Australia, in any of the positions. Solves our line out woes and actually makes our line out a weapon, is consistently one of the top tacklers, has the speed to play 6 and also runs the ball in tight. I can’t fathom how he couldn’t start for the Wallabies, even if we opt to run the bloody Pooper, which we shouldn’t. Risky to start someone with 0 test experience in a World Cup year. Would run him from the bench a couple of times first just as a precaution. Agree with you otherwise though. Always found it a bit of a joke that Skelton got 18 caps for the Wallabies and Jones currently only has 3. I think that’s an odd comment, given the other option is to go back to players with lots of recent caps who have done terribly at international level (eg Hanigan). It is also a reason not to pick Naisarani, another inform player. Why is it risky to pick someone without recent caps in a World Cup year when we have a rugby championship first to test things? Scratching my head on that one. Pick your best team, and your team will be the best. Milne-Skudder debuted in 2015 and look how well he went. Play the best team you can select and forget that they may be test rookies, we need to stop worrying about that and handing out caps to players who played well 7 years ago yet still get selected on 2011 form. But let’s be honest, as James also says, it was always staggering he didn’t get more caps before he left. It’s probably partially because he was regularly played at lock, when 6 was always his best fit at international level. Yep, he was also unlucky that Fardy was there then. From the time of Elsom’s 09 decline to Fardy in 2013 we had no one, but from 2013-15 Jones was stuck behind one of the best 6s in the world. After Genia and Pocock, Jones is third player picked in the 15 for me. Naisarani at 8 and you have a very good, balanced back row. Hooper and Loto off the pine. Here we go Jimmy – good work rate, good in the line out, good in the Contact, good in the breakdown (defensive and offensive), good in attack. Leave little to exploit…. Rebels looked like they were cruising up to half time. The Wolves pull it back to 28-15 and then the Rebs go into panic mode for 10 to 15 mins and play a disjointed up tempo game trying to match the Wolves. Bad mistake. If they hadn’t scored next to take it out to 33 points I would have been worried. As it is I think the score flattered the Rebs. Way to many penalties though the ref seemed to me to be favouring the Wolves. Watched most of the second half. Exciting attacking but some of the SW D was embarrassing. They just about laid out the red carpet for Genia’s try. Most of that credit is earned by wearing teams our early so the gaps r there latter. …. Great vision by Genia! Great game with some really good plays and people putting their hands up for further honours. I like that they have identified a couple of strengths and really put effort into it so it becomes a strength in attack and defence. Firstly… The YC’s at the death? Thought they were all a bit harsh. I thought Tupou was barely offside, the card for the cleanout was a definite penalty and one that I’d like to see penalized regularly, but it happens at literally 50% of the rucks in every game, and is never penalised. So to go to a YC at the death is somewhat pointless. Lastly, Magnay, that was a farce, even worse given it was ‘confirmed’ on the big screen! He hit the side of the upper arm, Magnay’s left arm went across the opponent’s chest (and down), and he took ZERO steps after the pass was thrown (i.e. there’s no way he was late, or could pull out of the tackle). It was a terrible call. Secondly… Best part of the match? Cottrell’s post-match interview. “We played terribly, so it was great to get the win.” No false humility in it, very straight. How awesome is that?! To see that sort of hard, honest self evaluation live? I actually agreed with him – the performance wasn’t a patch on the game against the Reds. Much less disciplined, composed. Lots of points were either very soft or fortuitous, rather than truly earned. Not saying that Cooper and Genia’s tries weren’t done through great awareness (and the support lines for Cooper’s try – everyone BEHIND the ball carrier, having the option of cleaning over or sweeping out for the pass at pace – great to watch, why can’t everyone else support like that?!) 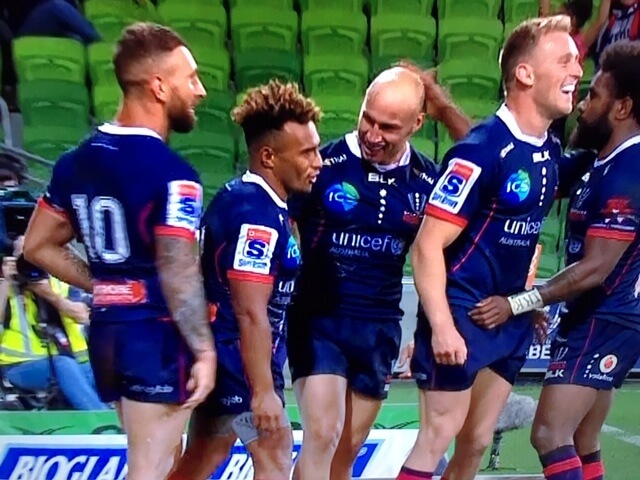 – Genia changed the set play and didn’t feed Tupou (given Parker was fixed on Tupou), Meakes put in some great footwork to be able to stay free to hand off the ball. But in a game where the opponent couldn’t win their own lineout, they had to do far too much defending. Oh, and I’ve got to whinge about the commentary… Turinui’s saying Quade probably should make the wider squad (really? Who’s worth of keeping him out on form? ), Horan saying the real test of Genia and Cooper will be when they face one of those bigger Kiwi sides, who play more like Test Rugby. Horan asking, “What will they do? How will they fix their old problems?” I’d have thought the way they ran the game and played field position against the Reds was pretty close to a perfect example of how to run a game where your forwards don’t have consistent dominance and don’t provide lots of front foot ball… It’s something the Reds did pretty well back in 2011, too. Timmy Horan: “Quade has to start playing test match rugby”. They’re all as bad as each other. Pathetic that most casual Australian rugby fans have to let about the game through these clowns. Also, I don’t think they played terribly. It wasn’t a vintage performance, but no team that scores 4-5 tries and dominates an opposition line out to such an extent can be said to have played terribly. They played well imo, but also have room to improve. Alot of their tries were off the back of good team play, both the pressure from rush defence and the flat nature of their attack. They may have looked opportunistic or down to a poor opponent but many were forced and no accident. For eg Hodge’s charge down and Meakes grubber regather. These tries don’t present themselves unless the hard work is done in the lead up. They play smart, team rugby. It’s what we’ve been waiting for for years as Aussie fans! It wasn’t terrible, but they weren’t at their best. Like I said, they dominated the lineout, and then defended far too much. Because they made a lot of unforced errors… They can do better, and their attitude means they will. Nevermind the analysis, that was a great game to watch! Enjoyed the attacking styles of both teams, a lot of tries scored, some nice passages of play, Rebels lineout, Masirewa’s footwork. Despite the scoreline Sunwolves never gave up, all good stuff for mine. Semisi Masirewa is only 26yrs old?!? The guy looks mid forties at least! Surely Rangi must get a Wobbly call up. The guy is a trooper. The Pingers are not a small pack so for the Scum to keep pinching lineout after lineout was quite something. Thanks for the write-up! It sounds silly given the scoreline but I felt the Rebels were lucky to be playing an out of sorts Sunwolves side. When we had set piece ball, we were lethal and ran a number of great backline plays with fantastic support lines. But our restarts were awful, there were still too many knock-ons in attack, and both Sunwolves tries had bad missed tackles / defensive reads in the lead-up. I hope we can build on our successful results to build a complete 80 minute performance in coming weeks. I was there at the ground and the crowd was really disappointing. Didn’t see an official figure but it looked well below 10,000. I know it was the Sunwolves but compared to the big crowd for the Highlanders earlier in the season it was a shame more of us aren’t getting behind a successful Rebels side.